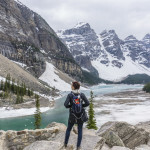 After a couple days in Banff followed by driving highway 1 (and part of the scenic 1A) we knew we wouldn’t be disappointed by the rugged beauty of Lake Louise, Alberta, Canada. Our first impression as we rolled into town was “this is one tiny place” and we love that! We decided to start our Lake Louise adventures by driving through town (make sure you don’t blink), that’s when we realized this is a very, very small town. Most ski towns, or National Park towns we’ve visited over the years seem to have a decent sized community center with a quaint feel, however Lake Louise felt a little broken with the ski area on one end of town, the fancy Fairmont Chateau hotel resort on the opposite end of town and this sorta lost strip-mall-esque “village” in the middle. I’m sure there’s method to the madness but it just seemed a little odd. Its actually not a town, it’s a “hamlet”. I looked up the definition and it basically means a settlement smaller than a village…that makes sense. Population is estimated around 1000 residents in 2001, but more recent estimates are even lower, so yes it is very small. 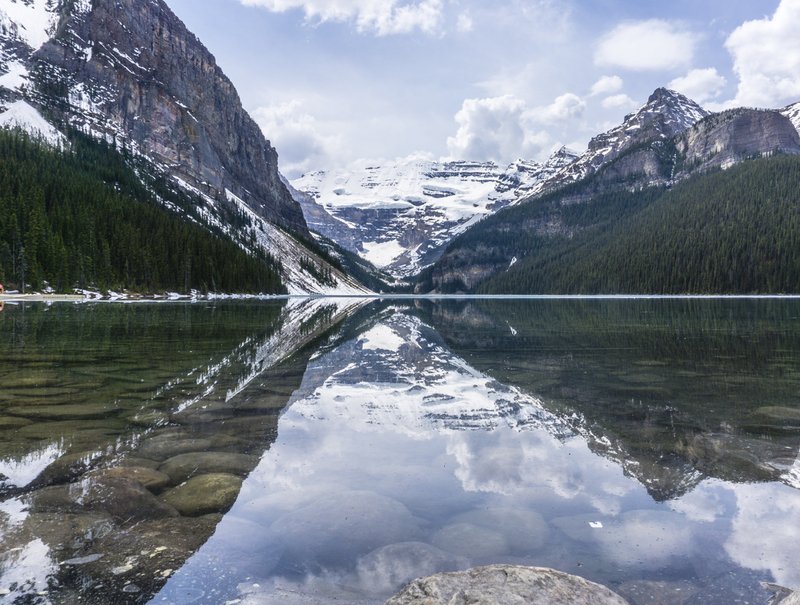 Even though Lake Louise is famous for beautiful Moraine Lake there actually is a Lake Louise that was named after a daughter of Queen Victoria in the mid 1800’s. Lake Louise was originally called Laggan and was not much more than a station along the Canadian Pacific Railroad, so a cocktail at the oldest building in Lake Louise (The Station Restaurant) could have been fun. Lake Louise is located within the borders of Banff National Park so an entry fee or a Discovery Pass is required during your entire visit. We were told by many Canadians that Lake Louise was smaller than Banff and Jasper so there would be less crowds however we found it to be quite the opposite. Our campground was nearly full both nights, and most of the “top” attractions seemed just as busy as Banff, granted we weren’t here during the height of the season so your experience may be totally different. On the drive from Banff to Lake Louise we were told by locals to get off the main highway 1 and take the scenic route 1A, so we did. I can’t say it’s a more scenic route because both routes are simply gorgeous, but the 1A is the route that will take you to Johnston Canyon and the falls. Johnston Canyon is a worthy stop en route but the magic on a busy day isn’t quite the same (hence why we had to park on the side of the higway nearly 1km from the trailhead). The trail is fairly narrow so having to pass full sized strollers, giant dogs, and families 3 wide can make for a frustratingly slow trip. If there’s any way possible to visit on a weekday early AM or late PM that would likely be your best bet for a more relaxing falls experience. That said the hike on the “suspension trail” up to the falls was unique and the lower and upper falls were both fantastic, especially the “soaked cave” at the lower falls. Once arriving in Lake Louise finding a good site at the Campground proved to be a semi-frustrating experience. Locating a spot with even a glimmer of sun to charge our batteries with solar, finding a site that wasn’t closed or crammed in next to another RV proved to be difficult, so we ended up wasting nearly an hour for such a mundane task that should only take a few minutes. Because we’ve arrived before the “season” in Lake Louise its first-come first-served and the more secluded non-electric sites are closed off and for whatever reason half of the sites in the main loop were closed too. Don’t expect peace and quiet here, we must have heard a dozen or so trains pass throughout the night and the canyon walls provide an acoustic surround sound of the loud horn. There is an overflow campground just a few miles south of town that’s 1/3 the price but we didn’t feel comfortable leaving the RV there all alone day and night since we had plans to spend every possible minute in town and on the trails. In busier times we’d recommend staying in the overflow or the non-hook up side of the campground. A beautiful view from the top and an interesting “wildlife center” with stuffed animals and educational displays. Hiking or biking is not allowed because it is considered a wildlife corridor, so all you can do is go up top and enjoy the view. 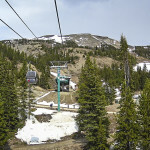 This is fine, but we prefer the non-ski resort gondolas (like the one in Banff) and sky trams because they are typically surrounded by nature and not dormant ski runs. It was a bonus you can actually choose to take the open ski chair or a proper gondola car depending on the weather…as you can see we chose alfresco for our trip up. We arrived around 5pm and it was pretty darn crowded so we figured we’d hop on the Consolation Lakes trail, unfortunately it’s required by law to have 4 people minimum due to bear activity (if caught the sign said it’s a $5,000 fee), but we couldn’t find anyone to join us this late in the afternoon…bummer! Instead we made our way up the rock trail for a top-of-the-world view of Moraine Lake. From there we walked down the hill and along the frozen shoreline of the lake. We were blown away by the ice crystals near the water’s edge. Seriously this has to be one of the neatest things we’ve seen in a while and we ended up spending over an hour walking along the water’s edge. It wasn’t the perfect day for photography considering the grey clouds moved in and covered the tips of the 10 peaks, but all in all the majority of the people were gone by 6:30 pm and we were left alone with two little Harlequin Ducks to wait for the water to turn to glass for an attempt at that quintessential Moraine Lake photo. 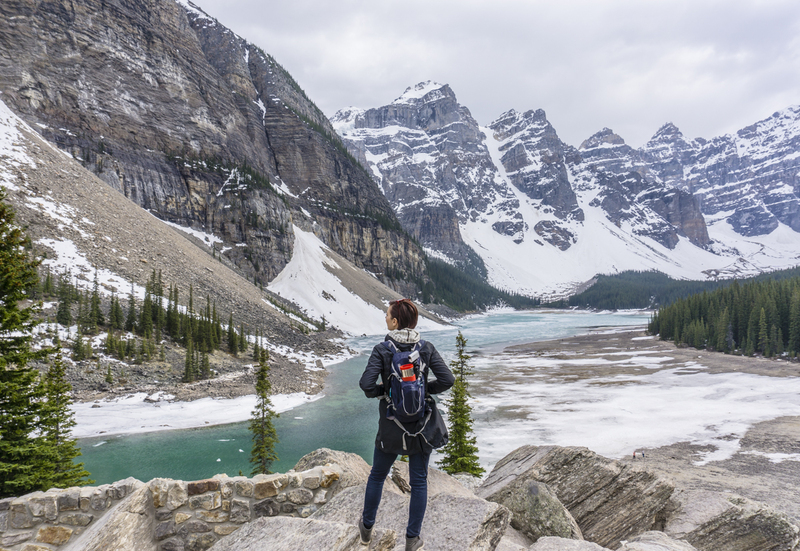 Lake Louise is famous for its never-ending list of hiking trails. It’s a real bummer we didn’t have more time, and that we were early in the season. So many epic hikes we didn’t even get to touch: Helen Lake/Dolomite Pass, Larch Valley, Bow Glacier Falls, and Saddleback Pass. There are even a few hikes that stop by a tea house! Imagine hiking for 2 hours and finding a beautiful lake along with a proper tea house where you can sit and enjoy hot tea and a slice of pie! Oh man, you don’t know how upset Nikki was that none of the teahouses were open during our short visit. My number one regret of arriving early: Missing the Valley of Ten Peaks (aka. Eiffel Lake trail) hike that provides unreal views of the 10 famous peaks. Visitor Center – They have WiFi but they only allow you to browse their website (or at least that is all that would work for us) which seems ridiculous for an internationally visited town. Explorers Bar @ Lake Louise Lodge – Very fast WiFi, but their beer and cocktail offerings weren’t anything to write home about so we ended up going safe with a Guinness. We were hungry for dinner but the menu was a little uninspiring for pesca-vegetarians like us, so we decided to skip and instead cook a late dinner in the RV. We did ask our waitress if there was anywhere in town that she recommended for tasty locavore (veggie friendly) fare and she recommended driving to nearby Field, BC to a place called Truffle Pigs Bistro. I looked it up and it seems spot on for our style, but we didn’t have time to make the drive. Trailhead Café – We hit up the local coffee shop for some Calgary roasted black gold and a fresh baked pastry, but we just seem to be on a “miss” streak here when it comes to food experiences. Oh well, you win some and you lose some. They might have WiFi but it’s too tiny to sit and work on a laptop so we didn’t bother asking. 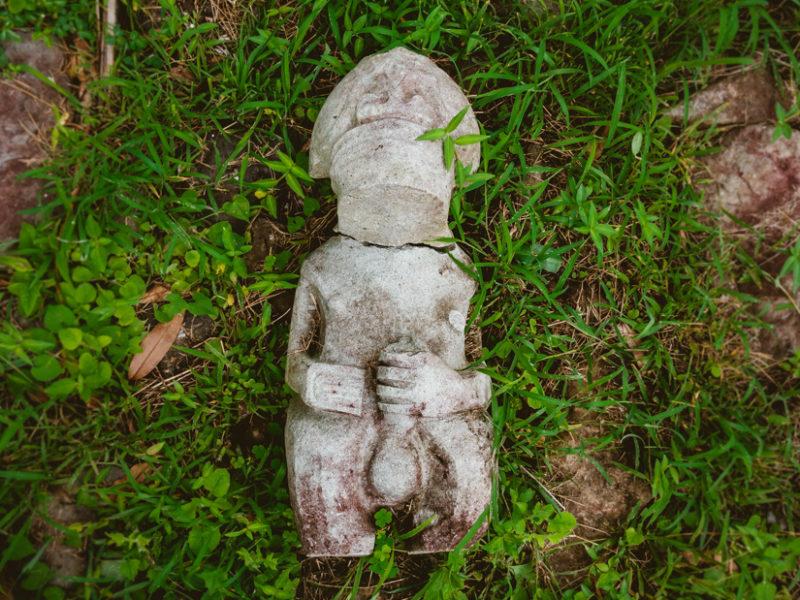 Spend your time hiking and exploring the wilderness that surrounds the town. 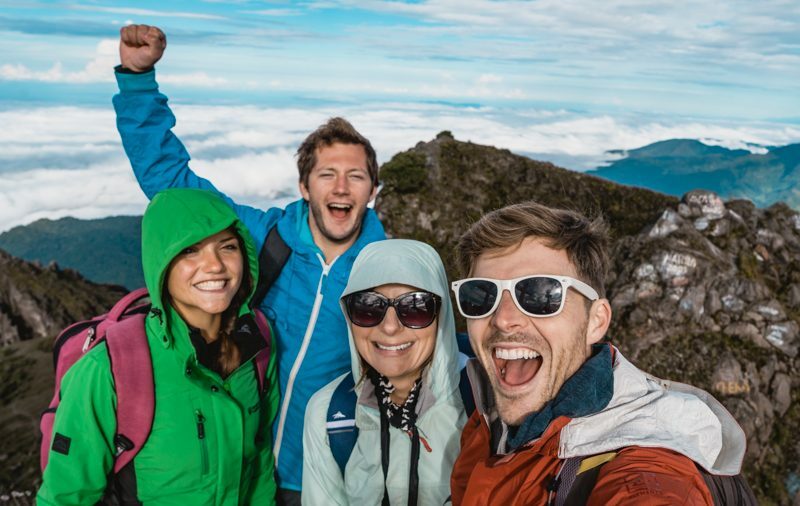 Peak every mountain you can because the views are spectacular! Early morning and late evening are best to miss the crowds, it stays light very late so long afternoon hikes are no big deal assuming you have enough people in your group to legally access the trail. Load up on good food and supplies before you head this way and plan on cooking in and packing lunches for the long hikes. Of course we were only in town for 2 days so what do we know…well there is one thing – We will come back for all those hikes we had to skip, and next time we’ll stay for at least a week! 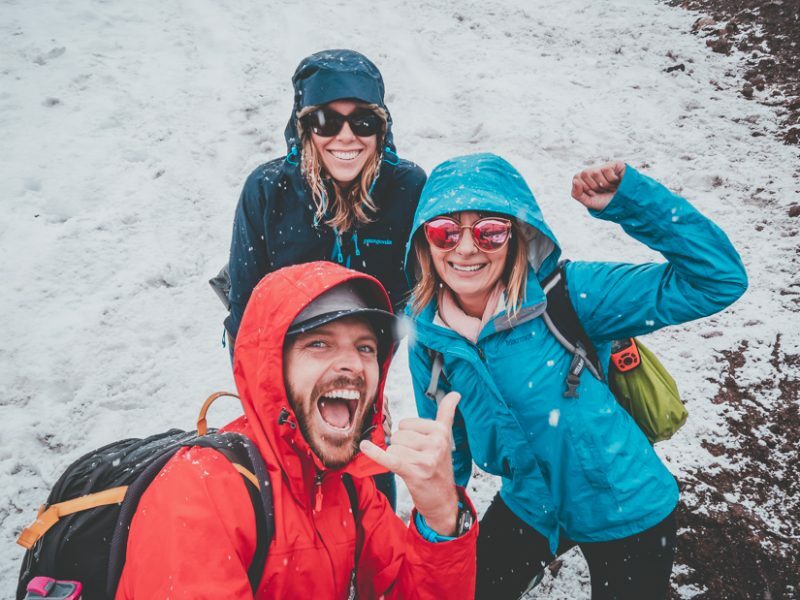 Help us, and other travelers, with your personal recommendations for Lake Louise in the comments below. We really want to come back and give it another go when we have more time to play. Check out our entire trip on our Alaska Page to see what we’re up to. 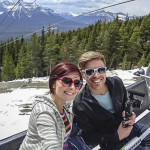 Disclaimer – Thanks to Banff Lake Louise Tourism for helping us plan our first adventures in the Canadian Rockies. Been reading some of your posts! Loving them. Just curious what time of year did you visit Lake Louise/Lake Moraine. My boyfriend and I are planning a road trip and are curious on the best times. Your photos look amazing so I’m hoping to be there around the same time that you were! 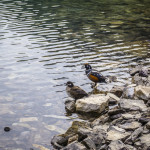 Good shot of a Harlequin duck pair. We appreciate your descriptions of Alberta, especially the places that weren’t as good as expected. We’ll be travelling through MT into AB – Banff, Lake Louise and Jasper especially – in April. Did you find any other ‘don’t miss’ attractions in those places? Emerald Lake is on Emerald Lake Road, not Yoho Valley Road. They are both in Yoho National Park though. Sorry for the confusion. Just a quick note to say LOVE your website, videos and travel blogs. I often pass on links to your site to good friends, who are Airstream people. I lived in Calgary for almost 9 years (now on the west coast) and was queen of the scenic drive when I was there. I can recommend a few great spots for your trip back if you have the time for them. Takakkaw Falls – On the Yoho Valley Road, in Yoho National Park, between Field and Lake Louise. Breathtaking scenery and stunning beauty all the way. Tight switch backs on the way up though. There might be a restriction on vehicle size, although tour buses seem to make it up there so you should have no problem. I’d Google it just to make sure. Emerald Lake – Also on the Yoho Valley Road between Field and Lake Louise. Jaw dropping scenery with Emerald Lake definitely living up to it’s name. There is a fairly expensive lodge but you can also rent canoes and there is a nice coffee bar as well. 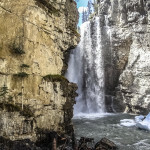 Natural Bridge – Also in Yoho National Park. A natural rock bridge formation surrounded by beautiful wilderness and the wild Kicking Horse River. Natural Bridge, Takakkaw and Emerald Lake are all within 20-30 minutes of each other in Yoho National Park. All make great day trips. Last on my list, but not least is Kananaskis Country. Wow, what can I say. A favorite scenic drive. Two spots not to miss in Kananaskis are the view from the Inn at Kananaskis and Boundary Ranch (take the ridge ride, you won’t regret it). It is simply awe inspiring. Bragg Creek, on the other end of Kananskis is a fun tour as well. The drive from Longview to the TransCanada or vice versa is a wonderful drive (takes about 1.5 – 2 hours). No shortage of scenic drives and cool places to check out in Southern Alberta (like the Bar U National Historic Site). Hope your travels are going well and you experience many travelling mercies along the way. Wow, thanks so much for all the awesome tips! It’s such a great area and I know we will be back to explore more of it! It’s one of those places you really have to plan on spending a lot of time to see and experience enough of it. It’s worthy of a whole summer! More great photography! Thanks for sharing! Thanks for visiting us! Next time you visit us make sure to check out the Whitehorn Bistro located at the top of the Sightseeing Lift which opens the first of June. They have just unveiled a new summer menu which includes lots of fresh locally-sourced delectable for vegetarians and foodies to enjoy plus the view off the patio is absolutely stunning. 1) May is WAY!!!! too early, even June is too early. The snow pack doesn’t really go away until mid-June. best time of year to go…September or even as late as October, provided the snow doesn’t fly. 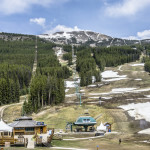 It will snow every single month in Lake Louise. If you can, avoid July and August. 10,0000-15,000 visitors a day come that time of year, although 90% of them are day-trippers. 2) Bring friends if you want to hike in the Moraine Lake area. Yep – it is PRIME grizzly territory and you WILL be fined if you are caught hiking without the perscribed number in your party. It might sound like a pain, but it is 100% for your own safety. If your without an entourage, hit the tea houses! The Lake Agnes Tea House is a shorter hike, but its a tough slog up the hill. The Plain of Six Glaciers is almost double the length, but not as steep and way better views. BRING CASH!!! The tea houses are completely off the grid and supplies are either helicoptered in or packed in by the staff. There is no road, and your feet are the only way to get there. Both require a certain level of fitness and having water on you is an absolute must. Helen Lake is spectacular, as is Bow Peak and pretty much any other hike you can take along the Ice Fields Parkway. By the way, don’t be disappointed that you didn’t get to Consolation Lakes, the name is appropriate. A consolation prize for not doing a better hike. If you’re serious about hiking in the parks, I highly recommend a book called Don’t Waste Your Time in the Canadian Rockies. If helps to weed out the marginal from the magnificent. 3) The train….ahhh the train….you will always know a local because they can stop their conversation for 5 minutes and then pick it up right where they left off after the train goes by. I never successful kept any of the pictures on my walls straight for more than 30 minutes thanks to the trains. Lake Louise is there because of the railways. Its an interesting bit of history, but guess what…the railway is still there! 4) Unless you dine fine, you’re going to be pretty disappointed in the dining experience in Lake Louse. It’s either the same burger that came off the same food supply truck, or you’re living life large with fondu at the Chateau’s Walliser Stube (which is well worth the weird cheese dreams you’ll have that night!) A bargain meal in LL is the Lake Louise Alpine Centre (AKA: the hostel). Yep, it’s that same burger but at least you’re not paying $20 for it. If you plan on cooking your own, best stop at Canmore or Banff for groceries first, the market is pretty small, although the liquor store does have a remarkably good selection – thanks to the locals employed in food and beverage. 5) unless you really need a plug in, consider camping at some of the smaller and not so popular campgrounds. Mosquito Creek is open all year and Marble Canyon is a secret I’ll probably be lynched for revealing. I dare not say more, do your own research. Awesome tips! Thanks so much for sharing all this info with us as it will definitely come in handy for our next visit! OK so I give…… what in the world is a “pesca” vegetarian? Inquiring carnivore minds want to know! Thanx for the heads up…When would you say is their “regular tourist” season? We plan to do the Alaska trip next summer, starting from OH. June 2 (+ or-). What I might do now is hit Jasper / Icefields Parkway on the way up June 5th (+ or -) and hit Lake Louise & Banff on the way back home Aug 30 – Sept 10th (+ or -). I’ll be following your trip to AK. very closely. So inspiring, as always. Thanks for not sugar coating it and letting us know what to expect this time of year. As much as we love nature, we don’t love crowds in nature, and this post was super helpful. Beautiful photography!! Can hardly wait for your next post. It’s so awesome going along on this adventure with you. Honestly, we hiked up to the Tea House (and then some) a few years ago and it was quite an adventure, tho the trail was a little more crowded than we like. Looking down on the icy blue lake from various turns on our way up to the tea house was awesome … as we watched the lake grow smaller and smaller. Like you say, pick a weekday, go early or late, and just GO! PS: Your header photo is drop-dead gorgeous. If your headed to jasper,whistler campsite has full hook ups.once settled find horseshoe lake.its a great place.and hike up to pyramid lookout.the view is phenomenal…. We were at Lake Louise in August 2011. CANADIAN POSTAL WIFI: We paid the Canadian Postal service $5.00 for a 24 hour password to their wifi internet. We are sitting outside in the courtyard at Lake Louise Village grading. Each day you have to come in and pay $5.00 for the new password. The internet is fast when it works. However, it is the only internet connection for the whole valley. So when others are logged in, it can be slow and not even function. Great info to know and thanks so much for sharing! We took the hike to the teahouse by Lake Louise years ago in the fall. On the hike up there it started to snow and we were fearful of losing the trail on the way down but the teahouse was worth it! Love your new camera. Hope the rest of your trips gets better. Do you feel rushed trying to to Alaska? Nikki and Jason, I’m really enjoying your travel adventures through Canada. The photos are awesome! I use Firefox (updated yesterday) and did not have trouble viewing your website. You are in for a real treat as you head north. Glacier Park is fabulous with an incredible waterfall. There is a tunnel for the train that does a 360 degree loop inside a tunnel halfway up a mountain. It is neat to see the train entering the tunnel, coming back out, going back in and then exiting above all at the same time. If you enjoyed Banff and Lake Louis then Jasper will blow you away. You can see 13 glaciers from one overlook and you can take a special bus out onto one of the glaciers (bring an empty water bottle for thousand year old pure water). Enjoy!!! Mike…I am using the latest Firefox and I didn’t have any problems seeing any of this…FYI. Nikki and Jason, great posts…..keep them up. Looking forward to doing the same thing someday soon. Love the pictures…keep them coming . I’m so jealous of your adventures. Works fine in firefox latest version for me. Very nice post, Jason, and stunning photography! A bit late with this, but kudos on your site upgrade! I really like what you’ve done with the place and the keepsake theme! It’s always wonderful to see folks do well enjoying what they do well! Take care. Several years ago we travelled to Banff and Lake Louise with our good friends. We all rented canoes in the morning to explore the lake. It was gorgeous! My husband spent the afternoon fishing with my friend’s husband while we enjoyed high tea at the Fairmount. Later that evening we went to an upscale restaurant in Banff where my husband handed the chef four freshly caught (& cleaned) trout and asked him to prepare our meal….wow, it was fabulous! Wish I could remember the name of the restaurant, but it was a while ago. It was about as perfect a day can be for all of us! 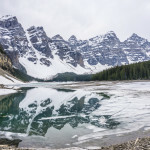 We were there just a few weeks ago and Lake Louise was covered in ice, Moraine Lake was closed and the back spots in the campground had snow. Very nice article! Looks like a ton of fun! Jason, is that a shotgun mic rigged to your sony rx? Did anyone else have this post lock up firefox? Latest version. It works fine in Chrome, but in firefox it hangs the browser, have to kill it in task manager. It did this in two different computers (in two different offices). Thanks for letting us know Mike! I will send this info onto our host.